When was the last time you looked forward to a spot of window cleaning? We all prefer to live in clean, tidy spaces, but when your knees start to limit your independence, simple tasks become much more complicated. Dusting, vacuuming, sweeping and scrubbing — we can’t make them fun, but we can help make them less painful. Our bionic knee braces can lift a large segment of your body weight on its own. Levitation®2 absorbs kinetic energy when you bend your knees and releases the energy when you straighten your knees. The Levitation can be used to help you crouch, walk, and climb stairs with less pain. Levitation is the world’s only compact and powerful bionic knee brace capable of reducing pain while enhancing strength and mobility. 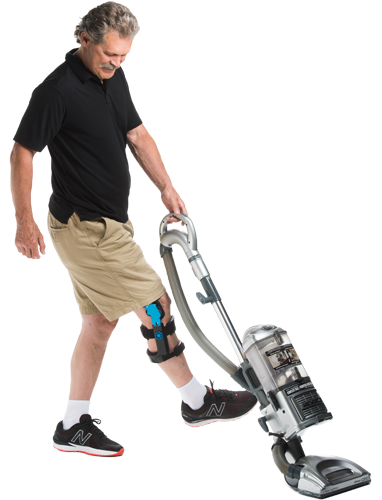 The Levitation bionic hinge stores energy as you bend your knee and returns that energy as you straighten your leg. Levitation assists your movement to get you back on your feet to the things you love most in life.